Nicole and Edward Reed were excited to learn at an eight-week ultrasound that they were having twins. But an ultrasound four weeks later left them uncertain they would ever get to meet those babies or experience the same joys and milestones they had with their first child, now 5. The ultrasound revealed the twins were Monoamniotic-Monochorionic (Mono Mono). Mono Mono twins are very rare—occurring in about one in 10,000 births and in only about 1 percent of monozygotic (identical twins) pregnancies. They share the same amniotic sac and placenta, which places this kind of twin pregnancy at high risk due to the risk of cord entanglement, cord compression, twin-to-twin transfusion syndrome (TTTS) and premature birth. 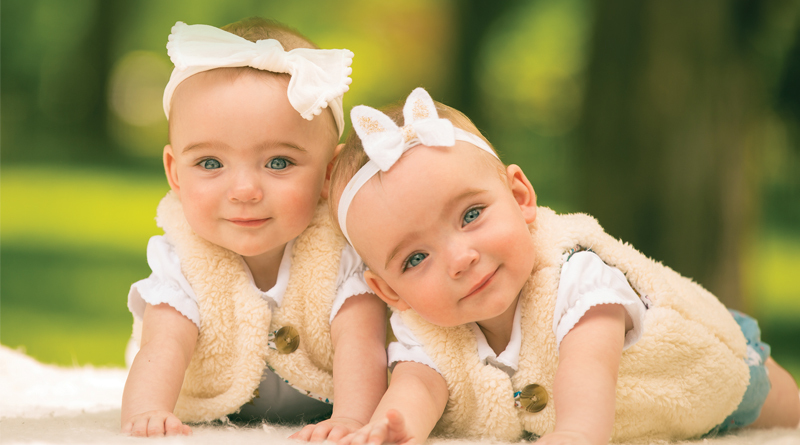 Twins with this condition have an in utero mortality rate of about 50 percent. Time and odds were against them. Armed with a diagnosis, the Reeds discovered the Junior League Center for Advanced Maternal-Fetal Care at Monroe Carell Jr. Children’s Hospital at Vanderbilt in hopes of giving their babies the best shot at life. Nicole had delivered their older son at Vanderbilt, but until she was referred she was not aware of the maternal-fetal center. The maternal-fetal at Vanderbilt features a multidisciplinary team approach and offers a customized evaluation in a single setting. The unique collaboration involves a team of pediatric specialists from cardiology, genetics, maternal/fetal medicine, neonatology, neurosurgery, perinatal nursing, radiology, social work, surgery, plastic surgery, palliative care, otolaryngology and urology. Nicole was 14 weeks pregnant when she first met the team at Vanderbilt. Nicole said the minute she saw Kelly Bennett, M.D., perinatal director of the center, everything changed. “She gave us confidence and comfort. Not only was she knowledgeable, but encouraging, calm and compassionate. I knew right then that I, that we, were in the care of someone who was very passionate. The entire team was that way and it made a huge difference,” Nicole said. The maternal-fetal center team meets weekly to discuss diagnosis, delivery plans and birth results while keeping in mind the need to focus on innovative research as well as provider education that could positively impact patients’ lives. With a patient load of nearly 2,500, the center continues to grow and attract families from all over the country. “We are very patient-centric,” said Bennett. “We want our families to know we care about them as people. They are not just patients to us. We are able to provide personal care to each and every family and situation. They are all different with various needs. “All of the specialties that make up our center come together in one space to offer support and care for our families. It is a collaborative effort to ensure every single family receives the specific attention required. Every single team member is incredibly important to the success that we all share when a baby leaves our care,” Bennett added. Most women whose twins are diagnosed Mono Mono enter inpatient care for regular and aggressive fetal monitoring until a planned cesarean section. Usually Mono Mono twins are delivered no later than 32 weeks and five days to improve the babies’ chances of survival. Nicole was admitted at 29 weeks to await the girls’ arrival. Three days later, due to frequent drops in their heart rates, Olivia and Alice were delivered on July 14, 2016, weighing 2.3 pounds and 2.9 pounds respectively. Both required a seven-week stay in the Neonatal Intensive Care Unit (NICU) at Children’s Hospital. Melinda Markham, M.D., neonatology director of the center, said the care provided in the unit as well as in the clinic itself is driven by the patients and their specific needs. “We are truly a unique machine,” said Markham. “We have so many subspecialties involved in our center to ensure that our patients, both mom and baby, receive the absolute best care possible, and we all work together to make that happen. Nicole and Edward Reed delivered their twins, Olivia and Alice, with care from the team at the Junior League Center for Advanced Maternal-Fetal Care. Photo by Daniel Dubois. When Markham joined the staff at Vanderbilt in 2007, the Fetal Center operated two days a week. Now the center has its own dedicated space and is at full capacity seeing families five days a week. “The important piece to remember about our center is that every patient coming through those doors has a heavy heart,” said Markham. “No one wants to be a patient in the maternal-fetal center. But we are here to help relieve some of their burden. There are lots of unknowns on that first visit. From the first appointment and often prior, we are working on the best plan for that particular patient. As their first birthday quickly approaches, the Reed twins are thriving and their parents are still in awe of the world-renowned center just minutes from their home. “I cannot say enough good things about everyone at the clinic. We would not be where we are today without their experience and good will. During pregnancy, mental health is very important and the team was a big part of that for me,” said Nicole. Like the Reed family, Bridgett Curry wasn’t completely sure she’d be returning home with a newborn for her second child. Even as she prepared a diaper bag for the delivery of her son in November 2015, she packed only four outfits, a few pairs of socks and one pack of diapers. These were all of the baby items that Bridgett had besides the crib and changing table that sat in a bare room back at home in Panama City, Florida. It was a far cry from the overfilled drawers, stockpiled diapers, baskets of toys and books, a decorated nursery and a host of family and friends that greeted her first baby’s arrival two years prior. Everything was different this time. During a routine ultrasound at her first obstetrics visit, Bridgett and her husband, Jake, were told their baby had about a 50 percent chance of survival. The baby had an abnormal opening in the diaphragm. The condition allows some of the baby’s abdominal organs—stomach, small intestine, spleen, part of the liver and kidney—to move into the chest cavity. Called congenital diaphragmatic hernia, or CDH, the life-threatening condition pushed the baby’s heart to the right side of his body and crowded his lungs. CDH is rare. It is seen in one in 2,500 births. Bridgett and Jake were given a laundry list of concerns. “There was a suggestion that I should terminate,” said Bridgett. “But I am a ‘If the good Lord brings me to it, then He will see me through it’ kind of person. At 32 weeks pregnant, Bridgett made her first visit to meet the team that would care for her and her baby at the maternal-fetal She would make three subsequent 16-hour round trip drives before having to relocate to Nashville, just two weeks prior to Marshall’s birth. On Nov. 20, 2015, Marshall Curry was born weighing 9 pounds, 11 ounces. Both mom and baby had a full team at the ready for the planned cesarean section. As soon as Marshall was born, his team rushed him to a waiting bed and stabilized him. Bridgett was able to kiss him briefly before he was whisked down the corridor to the NICU at Children’s Hospital. “I ran right alongside of them that whole quarter of a mile,” said Jake. “I sat outside of the unit and looked through the glass doors. There were so many people around him that I couldn’t see him. It was a very emotional time. Thinking back on it, I still get worked up. “With Lily (the Currys’ first child), I was able to walk her to the nursery. I could hold her. This was hard because we were so happy about Marshall’s arrival, but we felt a bit helpless,” he said. Jake and Bridgett Curry with their daughter, Lily, and son, Marshall, who had a 75 percent chance of survival at birth. Photo by Lana Williams. Marshall was placed on ECMO (Extracorporeal Membrane Oxygenation), a method of temporary lung and/or heart support for infants, children and adults experiencing severe pulmonary and/or cardiac failure. It is used to treat some newborns with CDH—the primary reason Bridgett was attracted to Vanderbilt. Established in 1989 by John Pietsch, M.D., the ECMO program at Vanderbilt was the first in the state and is one of the largest services of its kind in the nation. It has been used to treat more than 1,000 patients. ECMO is a life-support system that oxygenates the blood through a machine that has an artificial lung and returns the oxygenated blood back into the body. It is particularly effective in term- and near-term infants with respiratory failure or congenital heart disease, by providing a crucial interim cardiopulmonary support both before and after surgery is performed. “We have a solid reputation,” said Pietsch, co-director of the maternal-fetal center and surgical director of the ECMO program. “ECMO has allowed survival rates in CDH babies to improve. But it is just one piece of the treatment plan. We have a team of people here working to solve the puzzle. “When I think of what we are able to do for these families,” said Pietsch, “when they go in for their first ultrasound, they are so full of excitement and joy. And then, they are told there is something wrong with their baby. Then they come to see us. For that the Currys are grateful. On Thanksgiving Day, Marshall, then 6 days old, was removed from ECMO. It was three days after a successful CDH repair surgery. At 2 weeks old, Marshall finally opened his eyes. A few days later, his mom held him. He was allowed to go home at 39 days old. He returned to Vanderbilt for his 3-month checkup and again at 6 months. It was at the last appointment that his mom could finally exhale, she said. “He was given a clean bill of health,” Bridgett said. “To look at him, you’d never know anything was ever wrong. He fought hard from day one. And now he is your typical 1-year-old with just a few scars and a little different breathing (the CDH caused one of his lungs to underdevelop, but it will grow).